During the photoshoot at this Roma's Hospitality Centre wedding, besides taking formal or posed photographs, I also wanted to create some images that reflected the atmosphere of the day. This is a shot I usually do with the groomsmen. At the beginning of the photo shoot, I asked him to walk towards the camera and look at each other, mimicking the Reservoir Dogs famous photograph. In this case however, I asked the girls to walk slowly and talk to each other while completely ignoring the camera. To increase the dynamism of the image a tilt of the camera at the 5° angle using a technique called the Dutch tilt. To light this image, I used the ambient light and the Profoto B1 in TTL mode. 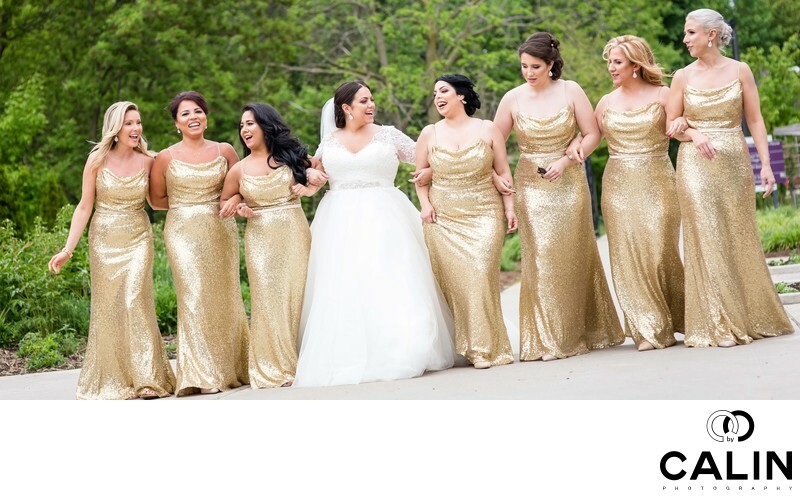 The lighting and the green background makes the bridal party stand out in this image. In post processing I increased the vibrancy of the colours and I added a vignette.